Blade is a Marvel hero well known for hunting supernatural creatures. There have been three major motion pictures featuring Wesley Snipes as Blade. Film rights for the character currently reside with Marvel and there are rumors of the character entering the MCU. He is known for battling vampire villain heavy weights like Dracula, Varnae, Morbius and Deacon Frost. All New All Different Blade - Is very different! Blade was born in London, England in a brothel. His mother was a prostitute as she was giving birth a stranger arrived claiming to be a doctor. The stranger turned out to be a vampire named Deacon Frost. Deacon attacked and fed on her as she gave birth to Blade. Vampiric Enzymes from Deacon's bites transferred into the baby and made him into a Dhampir. A Dhampir is a person who has been effected by a vampire but not fully converted. Deacon Frost was forced to leave before he could kill the child, but Blade's mother was dead. As a Dhampir, Blade would learn he would possess some supernatural abilities. His full powers would not blossom until later, but as Dhampir he had heightened athletic skill, heightened senses, supernatural attraction, and immunity from vampire bites. Deacon Frost would become one of Blade's most hated and reoccurring villains. Blade was raised and cared for in the brothel, primarily by its Madame Vanity. When he was 9 he saw an old man being attacked by vampires and rushed into help him. The old man was a jazz playing, vampire hunter by the name of Jamal Afari. Jamal saw the potential of a Dhampir vampire hunter and began to train him in martial arts and vampire hunting. As teenager Blade rejected the teachings of Afari and took control of a local gang called the Bloodshadows. Blade drove away the gang's former leader Cutter and began dating Cutter's ex, a girl named Glory. The Bloodshadows were attacked by vampire lead by Lamia. Lamia converted Glory into a vampire. In a rage Blade killed all of the vampires including Lamia. He resolved himself that he was destined to battle the Supernatural and returned to the path of vampire hunting. 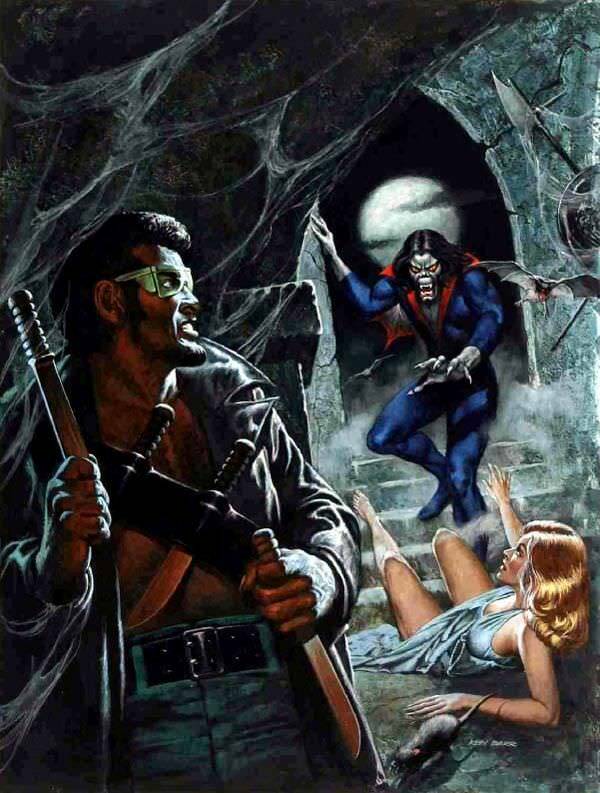 Blade would later be bitten by the living, vampire Morbius. The vampire toxin in Morbius's bite added extra powers to Blade. This gave Blade the full powers of a vampire but none of the weaknesses. The bite did give Blade the vampiric thirst for human blood which he must battle against. This effectively turned Blade into his own nightmare, a daywalking vampire. As an adult Blade had numerous battles of various supernatural entities including vampires, demons and werewolves. His most prolific adversaries were Deacon Frost and Dracula. He has killed both vampires many times but both find a way to come back. On a couple of occasions Blade has nearly been successful in wiping out all vampires and supernatural beings. Once he used a page from the Grimoire the dark hold to gain powers. Another time he teamed up with Doctor Strange who cast a spell called the Montesi Formula that wiped out vampires. Other supernatural beings like demons and Marie Laveau were successful in bringing them back. Marie Laveau working with Victor Strange (Doctor Strange's vampire brother) were successful in bringing back Varnae the original lord of vampires. Shortly thereafter Dracula is recreated and returns as well. Blade would join Doctor Voodoo in a battle for control of New Orleans. Deacon Frost and Marie Laveau had sought to control the city with a horde of powerful zombies. However, the combination of Blade and Doctor Voodoo were able to thwart them. Blade would work with Spider-Man to save Morbius and stop a vampire named Henry Sage from developing a day walker serum. A daywalker serum would allow vampire to eliminate their weakness to the sun, much like Blade. At some point unknown on his travel Blade fathered a girl named Fallon Grey. Fallon grew up in Oregon and has become a teenager slayer of supernatural like her father. Mother - deceased - Murdered giving birth to him by Deacon Frost. Blade has all the strengths of a vampire but none of the weaknesses. He can walk out in the sunlight, swim in holy water and eat Garlic. Blade does have the thirst for human blood. Blade is a highly skilled martial artist, fighter, and is an expert in the supernatural. Blade also hates the supernatural world and blames it for many of his problems and losses. He hunts and kills with a vengeance that can even terrify his allies. The fury with which he takes down supernatural creatures is driving force all its own and is comparable to that of the Punisher. 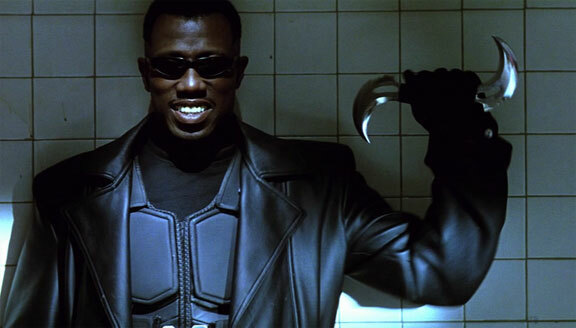 Blade was depicted 3 times by Wesley Snipes in a successful trilogy of action horror films. Marvel has recently (2014) re-acquired the rights to Blade. We think it would be cool. Someday. My tenure at Marvel started 17 years ago, and there were two things that sort of launched the modern era. One was X-Men, which was the first thing that people said, "Oh, there's life here." But a few years before that, there was Blade. A character nobody had heard of at all, had only appeared in a few issues of Tomb of Dracula or something, turned into a big franchise. That was always a great lesson for me, where you go, "It doesn't matter how well known the character is, it matters how cool the movie is." Which, many years later, would be the reason we do Guardians of the Galaxy, Doctor Strange. I think Blade is a legacy character now, and I think it would be fun to do something with him one day. Snipes has said he has some meetings with Marvel over the potential of playing the character again. Nothing official has been said about this by Marvel yet. The picture has been speculated to focus on Blade's daughter Fallon Grey. Rumors are that the Blade movie could features Blade's daughter named Fallon Grey. Fallon Grey has her own comic appearing in Oct 2015 called Blade the Hunter. The Fall Grey rumors seemed to be putting the cart infront of the horse. The comic series featuring Fallon Grey has never materialized and niether has word on a Blade film/TV Series. Kate Beckinsale mentioned there were plans to have a Underworld and Blade crossover but the plans were dropped after Marvel Studios said they had plans for the character. "They did ask a long time ago and I think our answer was, ‘No, we’ll do something with ‘Blade’ at some point.’ That’s still the answer. We still think he’s a great character. He’s a really fun character. We think this movie going into a different side of the universe would have the potential to have him pop up, but between the movies, the Netflix shows, the ABC shows there are so many opportunities for the character to pop up as you’re now seeing with Ghost Rider on ‘AGENTS of S.H.I.E.L.D.’ that rather than team up with another studio on that character let’s do something on our own. What that is? Where that will be? We’ll see. There is nothing imminent to my knowledge."